Copyright: © 2018 Duranti E, et al. This is an open-access article distributed under the terms of the Creative Commons Attribution License, which permits unrestricted use, distribution, and reproduction in any medium, provided the original author and source are credited. Introduction: The adsorbing capacity of membranes can be considered the third dimension of the depurative action of dialysis: diffusion, convection and adsorption. Some metabolites are almost totally bound to albumin, so, regardless of their molecular weight, removal with low flux or high flux dialysis membranes becomes difficult if not impossible. The aim of our work was to evaluate the adsorptive efficacy as well as the depurative of a new membrane with a medium cut-off: Theranova 400, PAES / PVP membrane with surface 1.7 m2 Baxter. Materials and methods: Four patients in chronic three-weekly dialysis were evaluated for over 6 months, treated with the Theranova 400 dialyzer filter, for 6 dialysis bicarbonate sessions. In every piece, blood tests were performed at the beginning and end of dialysis, for the first 3 dialysis and at the third dialysis of the second week, to evaluate besides the purification of the main standard parameters, also the removal of medium molecular weight solutes such as myoglobin, beta2 microglobulin and solutes such as indoxyl sulfate (F IXS) and pcresol (F PCS) which represent less than 10% of the free fraction being bound to albumin for more than 90% of their total concentration (T IXS and T PCS). IXS and PCS were also measured at the biginning of the third dialysis session of the week , in other 130 ESRD patients treated with various membranes . The statistical differences, before and after dialysis, were calculated with the Student’s t test for paired data. For the comparison of the values between Theranova and other membranes the Mann Whitney U Test was used for nonparametric data. Results: At the end of the 6 4-h hemodialysis sessions there was a significant decrease in both the low molecular weight parameters with a good KT/V and a urea clearance close to 300 ml/min. Mean MW concentrations were reduced by 50-75%, while F IXS, T IXS, F PCS and T PCS were reduced by more than 20%. The predialytic values of the last dialysis of the week tended to be higher and in some statistically significant in all the other membranes compared to Theranova. Conclusions: In addition to the high diffusional purifying capacity, the membrane shows a marked adsorptive capacity demonstrated by the effective removal of metabolites linked to albumin and therefore more difficult to remove. It will be interesting to follow in time the adsorptive capacity of this membrane and its clinical implication, especially in comparisons of cardiovascular and atherosclerotic diseases that appear to be related to the concentrations of these metabolites, practically impossible to remove with standard membranes. The purifying capacity of membranes can be considered three-dimensional in the dialysis process: diffusion, convection and adsorption. Some metabolites are almost totally bound to albumin, so, regardless of their molecular weight, removal with low flux or high flux dialysis membranes become difficult if not even impossible [1-3]. Currently, better purification levels of these molecules can be obtained through haemodiafiltration at high volumes of convective exchange, which however require characteristics of patients that limit its use: performing vascular accesses, elevated blood flows, not high haemoglobin levels. Theranova is a new category of haemodialysis filters, built with a "more open" dialysis membrane, medium cut-off (MCO), characterized by a hydraulic permeability such as high flow membranes (about 35 ml/h/mmHg/m2) and also by a consistent permeability with respect to medium molecules, within the uremic toxins, in the range of 18-45 kD. The aim of our work was to evaluate the purifying efficacy of this new membrane with medium cut-off: Theranova 400 (Baxter), membrane in PAES/PVP with dialysis surface of 1.7 m2 and a coefficient of UF of 48 ml/h/mmHg. Four male patients of average age 74.8 ± 1.7 years and dialysis 21.8 ± 12.4 months (Table 1) in three-weekly dialysis were evaluated. All patients switched to the Theranova 400 dialyser filter, for 6 dialysis bicarbonate sessions. In every piece, blood tests were performed at the beginning and end of dialysis, for the first 3 dialysis sessions and at the third dialysis session of the second week, to evaluate besides the purification of the main standard parameters, also the removal of medium molecular weight solutes such as myoglobin, β-2 microglobulin and solutes such as indoxyl sulphate (free IXS) and p-cresol (free PCS) which represent less than 10% of the free fraction being bound to albumin for more than 90% of their total concentrations (total IXS and total PCS). The values of predialitic IXS and PCS were also measured at the beginning of the third dialysis session of the week, in other 130 ESRD patients treated with various membranes (high and low flux polyamide, polyphenylene, PAN, PAES/PVP, high and low flux PS, high and low flux Helyxone, PMMA). Total and free serum IXS and PCS were assayed using the HPLC/MSMS method using the D4 p-Cresyl Sulphate as internal standard. The statistical differences, before and after dialysis, were calculated with the student’s t-test for paired data. For the comparison of the values between Theranova and other membranes the Mann Whitney U-test was used for nonparametric data. At the end of the haemodialysis sessions (QB=300 ml/min), there was a significant decrease in both the low molecular weight (MW) parameters with a good KT/V and a high urea clearance (280 ± 17 ml/min) (Table 2) and molecules at medium MW. Table 2: Values of low molecular weight parameters at the beginning and end of dialysis, KT/V and urea clearance of the filter. The concentrations of the parameters at medium MW were reduced by 50-75%, while total PCS was reduced by 19%, free PCS and total IXS of 30%, free IXS by 47% (Table 3 and Figures 1 and 2). The pre-dialytic values of the last dialysis of the week tended to be higher and in some statistically significant in all the other membranes compared to Theranova (Table 4). Table 3: Values of the highest molecular weight parameters depurated during six haemodialysis sessions. Table 4: Parameter values between the various membranes compared to Theranova. 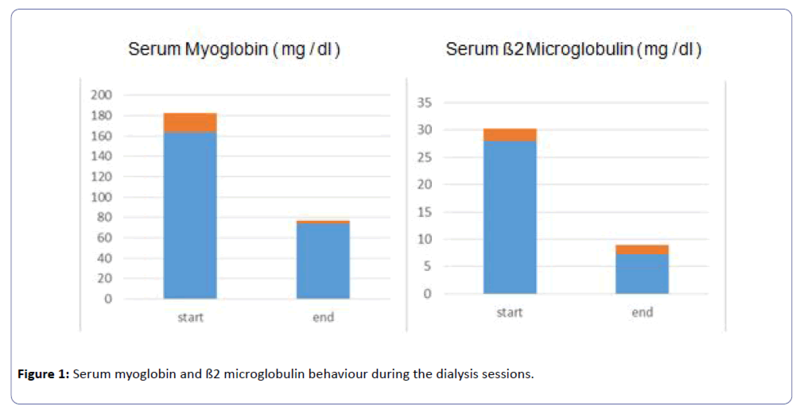 Figure 1: Serum myoglobin and ß2 microglobulin behaviour during the dialysis sessions. Figure 2: Total and free PCS and IXS behaviour during 4 dialysis sessions. 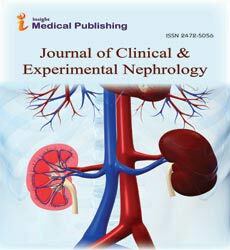 Studies have evaluated the clearance of protein-bound uremic toxins using different types of dialysis: high-flux membranes showed no improvement in clearance of these two toxins, given that the increased permeability of high-flux membranes is isolated primarily to large, non-protein- bound solutes. The addition of convective transport to conventional dialysis has also been investigated, albeit with conflicting findings: two crossover studies reported opposing effects of HDF on dialysis clearance, although both studies failed to show a superior benefit on post treatment plasma concentration of the toxins. Thus, it appears that diffusive transport should be combined with convection to obtain an essential tool to improve the removal of protein-bound uremic solutes [1-7]. HFR system could represent a new method to remove p-cresol . These new HFR systems are expected to greatly increase the amount of albumin bound p-cresol and, presumably, of other inflammatory mediators that can be retained by the cartridge and, therefore, to further increase their advantages respect to HD in protein bound solutes removal. However, the costs of the technique restrict its use to few clinical cases and it is difficult to extend the treatment to everyone. Even if our experience was conducted in 4 patients only, we can say that the Theranova 400 bicarbonate standard dialysis technique offers high purification for both small and middle molecules superimposable to those of haemodiafiltration with high convective exchanges [9,10]. In addition to the high purifying performance capacity, the membrane could also apply a partial absorptive capacity or a sort of molecules “entrapment”, which would be demonstrated by the effective removal of metabolites linked to albumin and therefore more difficult to remove, even if a previous work  would explain the removal of protein-related metabolites with the loss, during the dialysis session, of 5/6 g of albumin. However, our data, even if experienced in 24 dialysis sessions only, do not seem to confirm these results since at the end of the dialysis sessions , total protidemia and albumin increase even when applied for hemo concentration. Both IXS and PCS have demonstrated extensive pro-inflammatory and oxidative stress properties in vitro and have shown to be independent predictors of all-cause mortality, CVD and kidney disease progression in the CKD population. An association between free PCS and cardiovascular events was demonstrated in 499 CKD patients; similarly, an independent association with cardiovascular events and IXS was reported in a cohort of 70 CKD patients [1-6]. So it will be interesting to follow in time the potential capacities of this "high performance" membrane and its clinical implication, especially in relation to cardiovascular and atherosclerotic diseases that seem to be related to the concentrations of these metabolites, practically impossible to remove with standard membranes. Evenepoel P, Meijers BKI, Bammens BRM, Verbeke K (2009) Uremic toxins originating from colonic microbial metabolism. Kidney Int 76: S12– S19. Lin CJ, Wu CJ, Pan CF, Chen YC, Sun FJ, et al. (2010) Serum protein-bound uremic toxins and clinical outcomes in hemodialysis patients. Nephrol Dial Transplant 25: 3693-3700. Bammens B, Evenepoel P, Verbeke K , Vanrenterghem Y (2004) Removal of the protein bound solute p-cresol by convective transport: a randomized crossover study. Am J Kidney Dis 44: 278–285. Meert N, Eloot S, Waterloos MA , Landschoot VM, Dhondt A, et al. (2008) Effective removal of protein-bound uraemic solutes by different convective strategies: a prospective trial. Nephrol Dial Transplant 24: 1- 9. Meijers BKI, Bammens B, De Moor B, Verbeke K, Vanrenterghem Y, et al. (2008) Free p- cresol is associated with cardiovascular disease in hemodialysis patients. Kidney Int 73: 1173–1180. Taki K, Tsuruta Y, Niwa T (2007) Indoxyl sulfate and atherosclerotic risk factors in hemodialysis patients. Am J Nephrol 27: 30–35. Lin CJ, Chuang CK, Liu HL, Wang TJ, Chen CC, et al. (2011) The serum levels of P-cresol and Indoxyl sulfate in different hemodialysis vintage. J Clin Med Res 3: 114-119. Riccio E, Cataldi M, Minco M, Argentino G, Russo R, et al. (2014) Evidence That p-Cresol and IL-6 Are Adsorbed by the HFR Cartridge: Towards a New Strategy to Decrease Systemic Inflammation in Dialyzed Patients? PLoS ONE 9: e95811. Lorenzin A, Neri M, Clark WR, Garzotto F, Brendolan A, et al. (2017) Modelling of Internal Filtration in Theranova Hemodialyzers. Contrib Nephrol 191:127-141. Belmouaz M, Diolez J, Bauwens M, Duthe F, Ecotiere L, et al. (2018) Comparison of haemodialysis with medium cut-off dialyzer and on-line hemodiafiltration on the removal of small and middle-sized molecules. Clin Nephrol 89: 50-56.